Biologic drugs such as insulin commonly can’t be formulated as pills or capsules that are swallowed because the proteins or other biomacromolecules are degraded in the harsh environment of the stomach and gastrointestinal tract, and are poorly absorbed. This means that they have to be administered by subcutaneous or intravenous injection, and so patients with diabetes may have to give themselves life-saving insulin injections twice a day. A team of scientists at Brigham and Women’s Hospital, the Massachusetts Institute of Technology (MIT), and Novo Nordisk has now developed an oral drug capsule that, on reaching the stomach, injects insulin directly into the stomach lining. Inspired by the shell of the leopard tortoise, the pea-sized ingestible microneedle is designed to be self-orienting, so however much the capsule is jostled around as it reaches the stomach, it will always right itself so that the needle is in contact with and injects the insulin into the stomach lining, rather than into the stomach lumen. In initial tests in pigs the researchers showed that the self-orienting millimeter scale applicator (SOMA) could successfully deliver insulin to the bloodstream, without any apparent adverse effects. Scientists have been working on oral delivery systems for biomacromoelcules since 1922, the same year as the first insulin injection, the researchers noted. Unfortunately, this is challenging to achieve in practice, as the molecules have to navigate extremely harsh gastrointestinal (GI) environments with extremes of pH and protein-degrading enzymes, and then penetrate through thick mucus and cell barriers before they can reach the bloodstream. In fact, the team noted, preclinical technologies that have been developed to try and improve GI-based delivery of biomacromulecules have only achieved bioavailability of about 1%. As a result, protein and peptide drugs such as insulin have to be injected, potentially multiple times every day. And because injections are unpleasant, user-unfriendly, and increasingly expensive, healthcare providers may delay for years prescribing insulin in favor of less effective, oral medications. 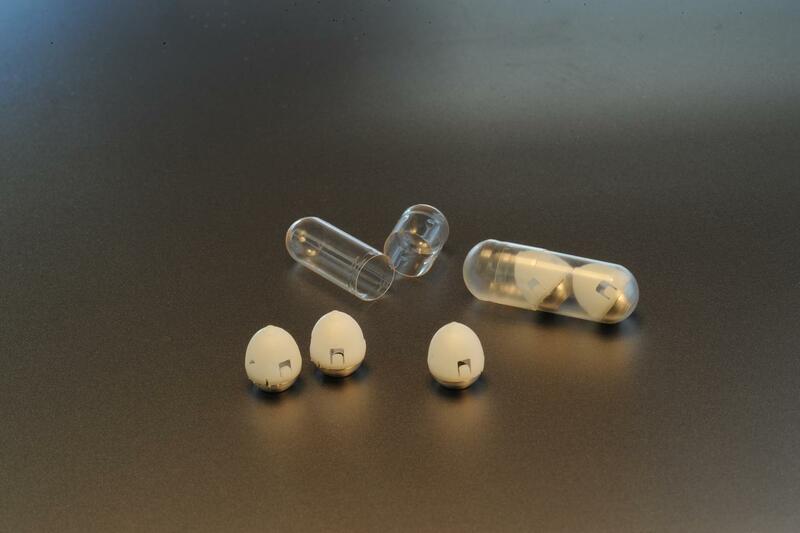 The concept of a drug-injecting capsule isn’t new. Langer and colleagues, including co-senior and co-corresponding author Giovanni Traverso, MB, PhD, an assistant professor at Brigham and Women’s Hospital, Harvard Medical School, had previously developed a pill coated with many tiny needles that could inject a drug into the lining of the stomach or small intestine. For their new capsule design, which is based on a single microneedle, or millipost, the team took inspiration from the shell of the leopard tortoise, Stigmochelys pardalis. This reptile, which is found in Africa, has a high, steeply domed shell that allows the tortoise to right itself should it roll onto its back. “Similar to a weeble-wobble toy, the leopard tortoise has a shifted center of mass and a high-curvature upper shell that enable self-orientation to the preferred upright position,” the team explained. But unlike a weeble-wobble toy, the bottom half of the tortoise is also stabilizing, so the animal isn’t easily pushed over. Using computer modeling the team developed a variant of the tortoise form for their insulin-injecting drug delivery capsule, so that it would always orientate into the correct position on reaching the stomach. “For the SOMA, we sought a self-orienting shape similar to that of the tortoise to ensure that the millipost would not misfire into the lumen if a patient leaned over during actuation,” they continued. The SOMA capsule houses a single needle, the tip of which is made of compressed, freeze-dried insulin. The needle shaft, which doesn’t enter the stomach wall, is made from a biodegradeable material. Inside the capsule the needle is attached to a compressed spring that is held in place by a sugar disc. The disc dissolves in the stomach, freeing the spring to trigger the micro-injection. The stomach wall has no pain receptors, so the researchers reason that patients wouldn’t feel the injection. Traverso, a gastroenterologist in the division of gastroenterology at Brigham, and a visiting scientist in MIT’s department of mechanical engineering, said development of the SOMA has been led by a few “critical” clinical observations, including that drugs are distributed very quickly through the body when injected into the stomach. “Moreover, we recognize that the stomach is insensate to sharp pain and very tolerant of small, sharp objects,” he added. For their reported tests in pigs the team used SOMA capsules with milliposts loaded with 0.3 mg of human insulin, but more recently the researchers have been able to increase the delivered dose to 5 mg, which is more relevant to the amount of insulin that a patient with diabetes may have to inject. The rate at which the injected insulin dissolves can be controlled when the capsule is prepared. In the reported in vivo studies it took about an hour for all of the insulin to reach the animals’ bloodstream.